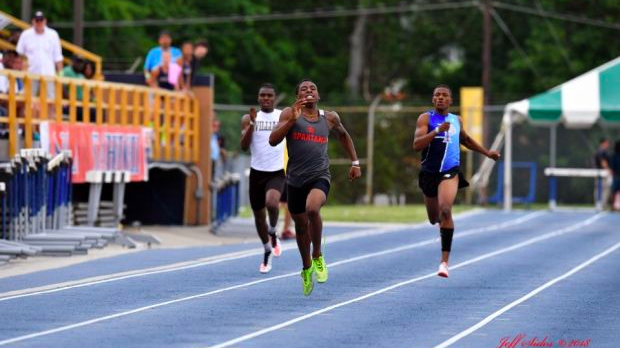 This weekend's Bershawn "Batman" Jackson Youth Invitational looks to feature some of the best sprinters and middle distance runners from North Carolina, as well as other stars from outside the state. The summer track schedule is rounding into full form with this event. Following scholastic events, many North Carolina athletes participated in the Powerade State Games last week, and this weekend's event gives them an opportunity to participate in another competitive meet. The boy's sprint events look to be extremely competitive, especially in the 100 and 400 in the 17-18 age group. In the 100, six athletes are seeded under 11 seconds, making for what should be a tight race. Top competitors in the 100 include Malcolm Croom-McFadden of Track Xplosion, Kobe Barnes and Terrell Johnson of Bull City Express, and Kamari Norman of JCP Performance, all of whom own PRs under 10.9. The 400 will feature NCHSAA 3A State Champion Khaleb McRae of Southern Durham, whose PR of 47.52 currently holds as the NC #1 time this year. McRae, competing for Durham Striders, will hope to better his state-leading time on Saturday, but could be challenged by Barnes doubling off of the 100. One of the headliners of the meet is Michaela Rose from Suffolk, Va. in the 15-16 age group. The middle distance star will look to pull off the 400/800 double this weekend in winning fashion. Rose currently holds a US #20 time of 2:09.43 in the 800, second among freshmen, and holds a PR of 54.96 in the 400. She has a clear path to the 800 win, as she is seeded 12 seconds ahead of the next fastest runner. However, Rose will be challenged by 13-14 400 world record holder Kayla Davis of Run U Xpress in a competitive 400 field. Davis won the 15-16 400 last week at the Powerade States Games and is in position to grab another win in the 400 this weekend. Davis holds the fastest seed in the race of 52.00, and her PR of 52.54 is far faster than those of any of her competitors. In the field events, Morgan Smalls will compete in all three jump events in the 15-16 age group, as well as in the 100. Smalls has been dominant this year in the field events, notably winning the NCHSAA 4A State Championship MVP award for her wins in the long jump, triple jump, and high jump, helping lead Panther Creek to a 4A team title. Smalls currently holds a US #2 height of 6-0.25 in the high jump and is ranked in the top 30 nationally in both the long jump and triple jump, and she looks positioned to improve those marks and earn some wins this weekend. And, it's fun to note that Bershawn Jackson Jr., son of the meet's namesake Bershawn Jackson, will compete in the 6 and under division. Jackson Jr. is seeded first in the 50 and 100, and is also entered in the Javelin.